Rosemarys Garden: What Is Special About Vintage China? 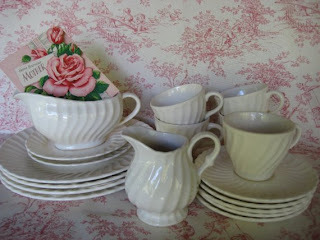 What Is Special About Vintage China? What's so special about vintage china? It reminds me of days in the past, special times spent with family and friends around the table. This is a simple set of white china from RosemarysGarden. During the 1950s we owned a set of Homer Laughlin "Virginia Rose" dinnerware with pink roses. There were also pink and green pottery bowls that held vegetables. In those days, we always sat down to a family meal, and the food was placed in serving bowls or platters and passed from left to right. 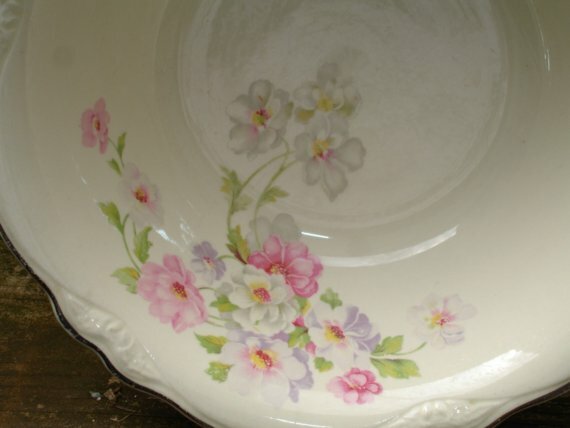 I found a beautiful bowl in the "Virginia Rose" pattern pictured above at Vintagecottagegarden. 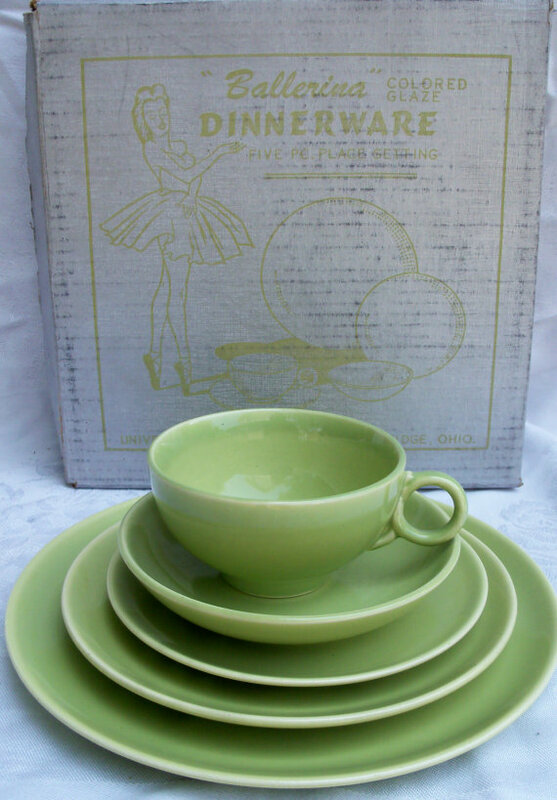 One of my aunts owned a set of Ballerina dinnerware, pictured above. I always loved dining at her house because I loved the colors of the dishes: a mix of chartreuse green, moss green, dove grey, and burgundy. I found a place setting of this lovely dinnerware at AndysAttic. I remember the Ruby Red glassware from the 1950s that we used on holidays; plates holding tidbits, sandwiches, and homemade goodies. The cups held the aromas of coffee and spiced tea. 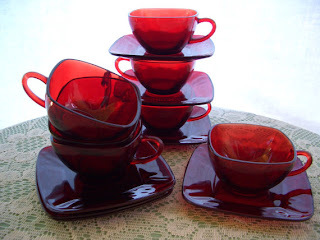 I found Ruby Red glassware at AnniesVintageRedone. 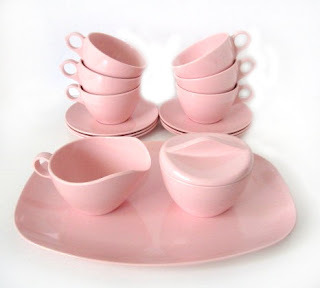 There was a set of pink Melmac that my mother bought during the 1960s. It was the latest craze during that time, and it was used on a daily basis. It was great because it didn’t break. 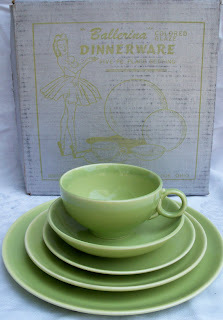 This dinnerware is featured in MKRetro. My Mom also bought a set of Noritake fine china in the 1960s. We used it for special occasions like Christmas, Thanksgiving, and birthdays. The cups were small and delicate with saucers. The set has been passed down to me, and it is packed away for a future daughter-in-law or grand-daughter. California Poppytrail. 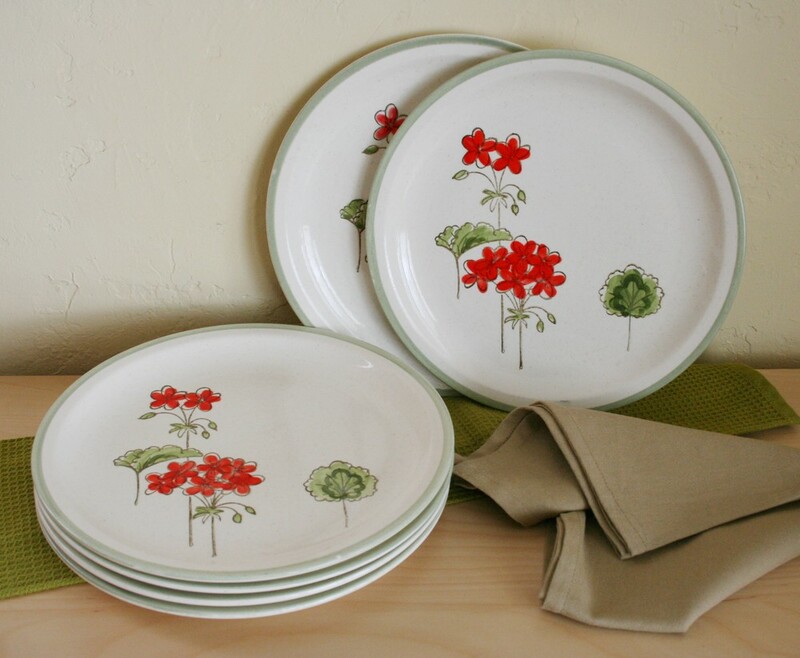 This china is pictured below and can be found at at TimeValley. I continue to love using vintage china. I love drinking coffee or tea from the small cups with dainty saucers. They have an old-fashioned feel and bring back memories of days spent with familiar people who loved and laughed and spent time in long conversation at the dinner table.